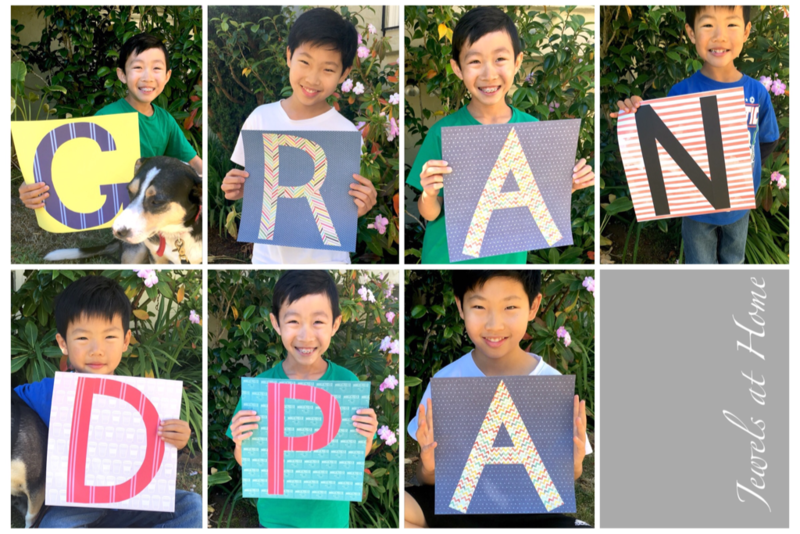 It’s so fun to get the boys involved in a creative project for Father’s Day. Remember when we made the mugs and aprons? Or even these simple cards? This year, the boys and I created these portraits for Steve and their grandfathers. You know by now that I have an endless supply of scrapbook paper, which I used to create the letters. The boys were really good sports (they aren’t always!) with taking the pictures, and I love the final products. I printed individual pictures and put them in a frame with three openings and a matte that the boys signed. 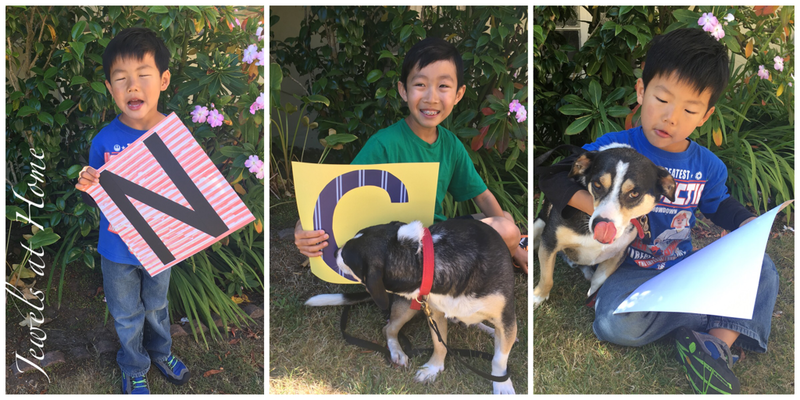 And you couldn’t take pictures of three boys and a rascally pup without some outtakes! Wishing the best to all the hard-working and loving fathers out there! 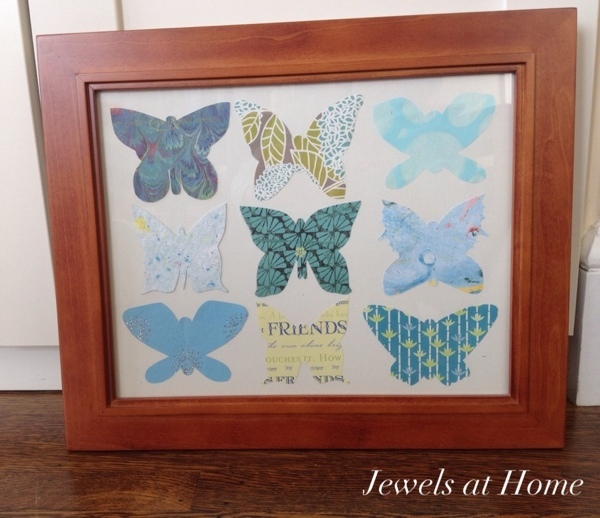 Here’s a fun DIY art project that you can customize so many ways. I added names to ours. What other ways would you customize this? We had a great time celebrating Easter with my sister’s family last year. I had wanted to make a garland with the kids, and a stack of drawings was the perfect starting point! 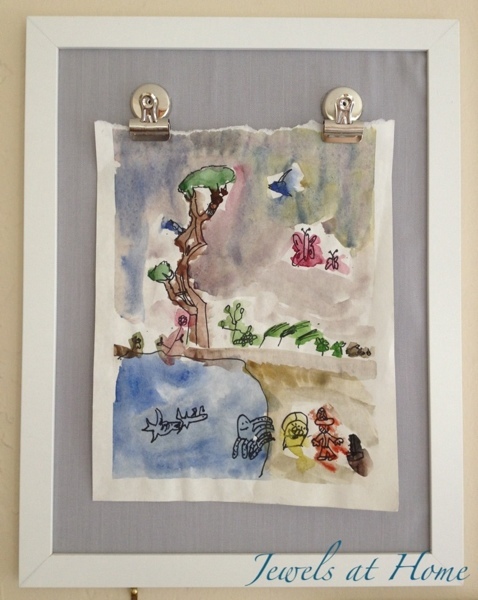 Why leave all those creations hidden in a pile when we could hang them up to enjoy? I made two templates out of cardboard: an egg and a bunny face. With older kids, you could add more shapes, but our three- and four- year olds barely managed with the egg, so this was perfect for us. J and his cousins chose drawings and created some new ones. We traced the shapes and then cut them out. I made two small vertical slits at the top of each egg or bunny, and we threaded some ribbon through. It was great to see these preschoolers practicing their fine motor skills and helping each other to put together our Easter decorations. 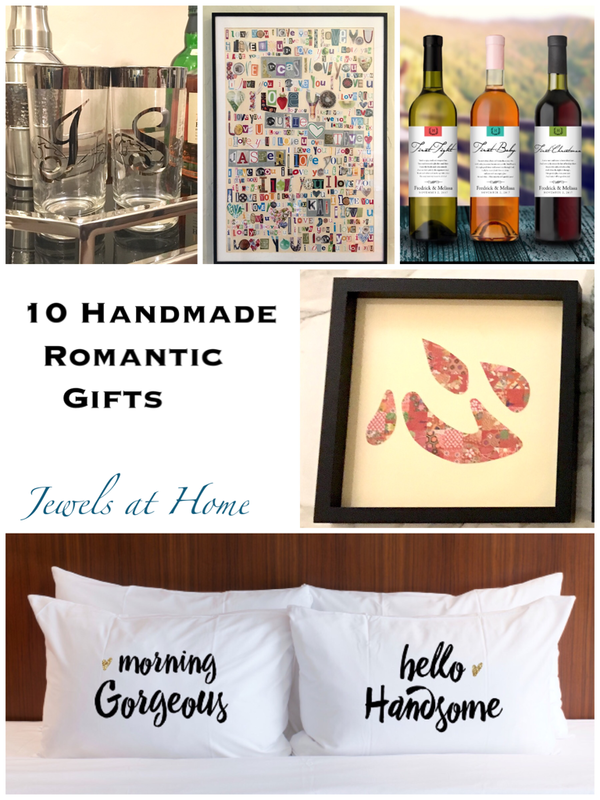 So, it was just Valentine’s Day and we’re going to Steve’s sister’s wedding in a few weeks, so I’ve been busy searching for the perfect romantic gifts with a handmade touch. Here are my favorite ideas. I’ve tried some of them and can’t wait to try the rest! I love this and all the other whimsical designs from ZCreate on Etsy, and how perfect that this business is run by a couple! 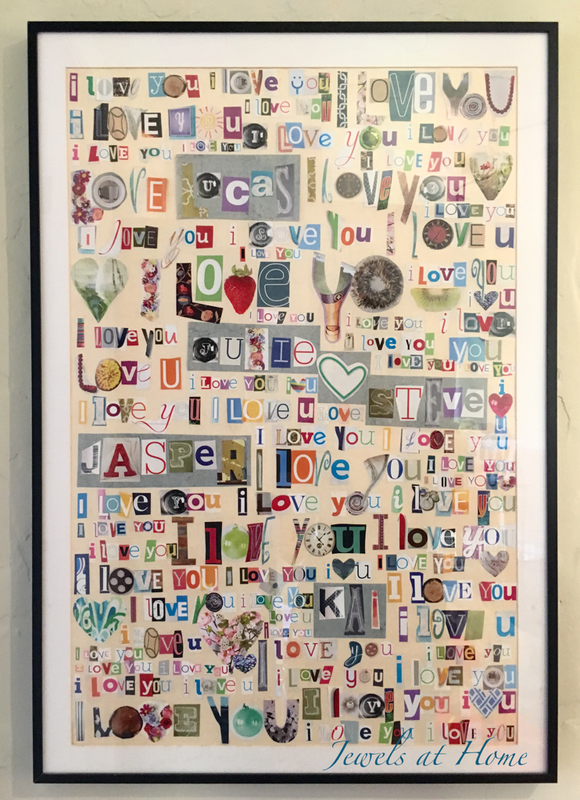 I made this collage for our family a few years ago. It took a lot of time and work, but it’s not technically difficult, and it’s almost free! 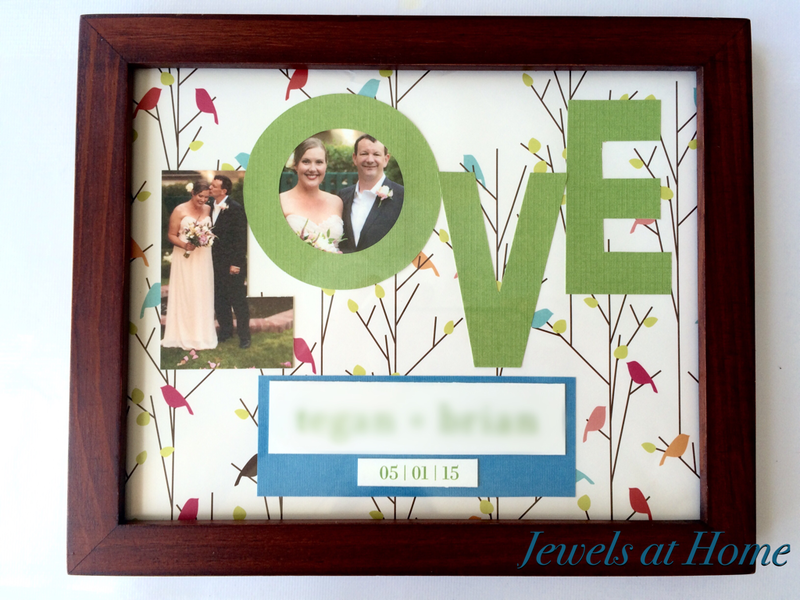 You could customize this with a wedding date or other details. This is what I actually ended up giving Steve for Valentine’s. 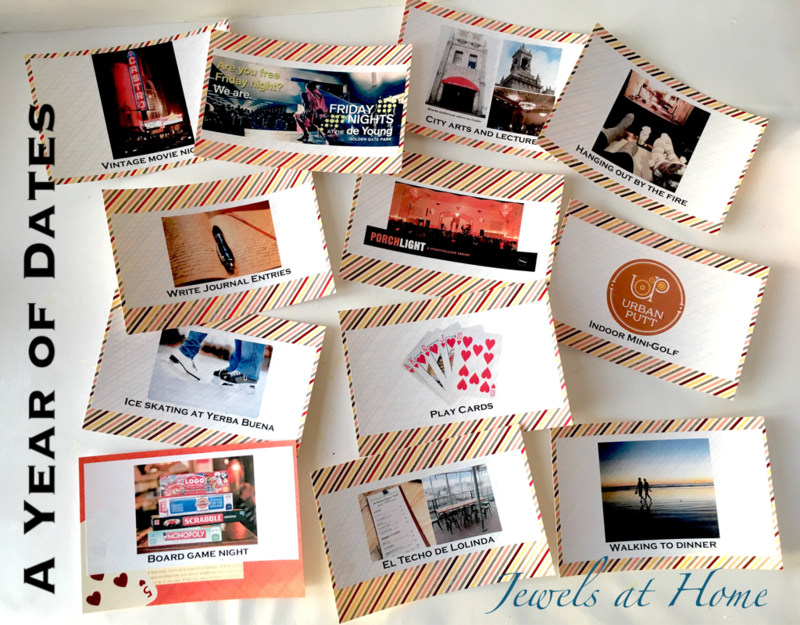 One activity for each month, some at home and some out on the town, including some local adventures I have been waiting to try! 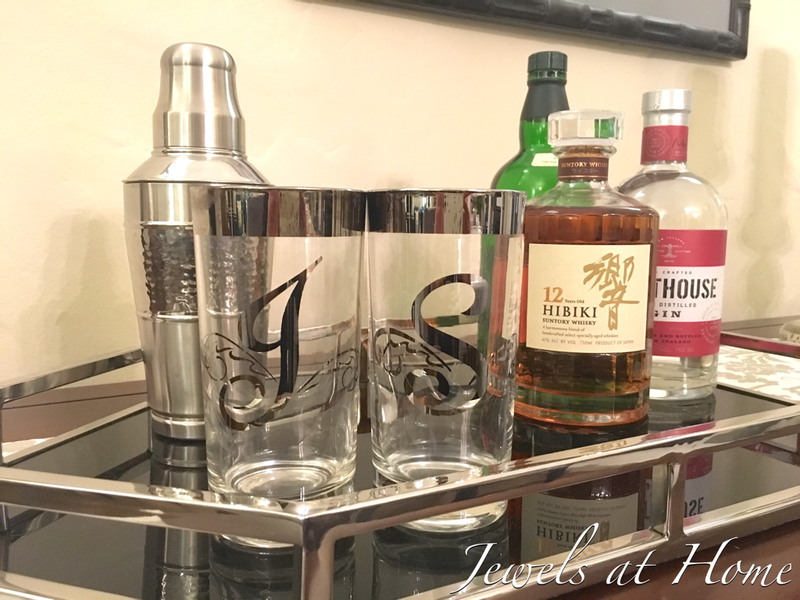 I love these vintage monogrammed glasses I found for our Mad Men party a few years ago. You could also make your own with Glass Etching Cream. What a fun way to personalize a gift of wine, with these milestone labels available from Label the Occasion and other sellers on Etsy. Or design your own and print on blank labels. I used Chinese characters (love, double happiness, and family), but you could do this with an English phrase, too. I printed out the template in reverse, glued one inch squares onto the back side of the paper, then cut out the template and glued it on a background. You can buy this from Etsy or make your own with some wood, nails, and red embroidery floss. I’ve been wanting to try this for a while! I made these luggage tags and other art projects out of wedding invitations. I found the self-laminating tags here. 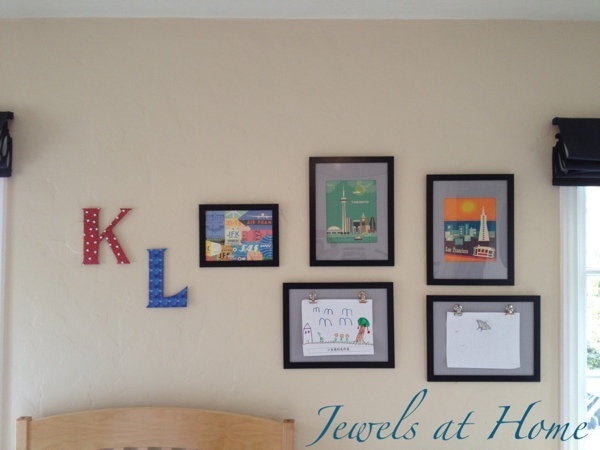 You could also do this with a birth announcement. 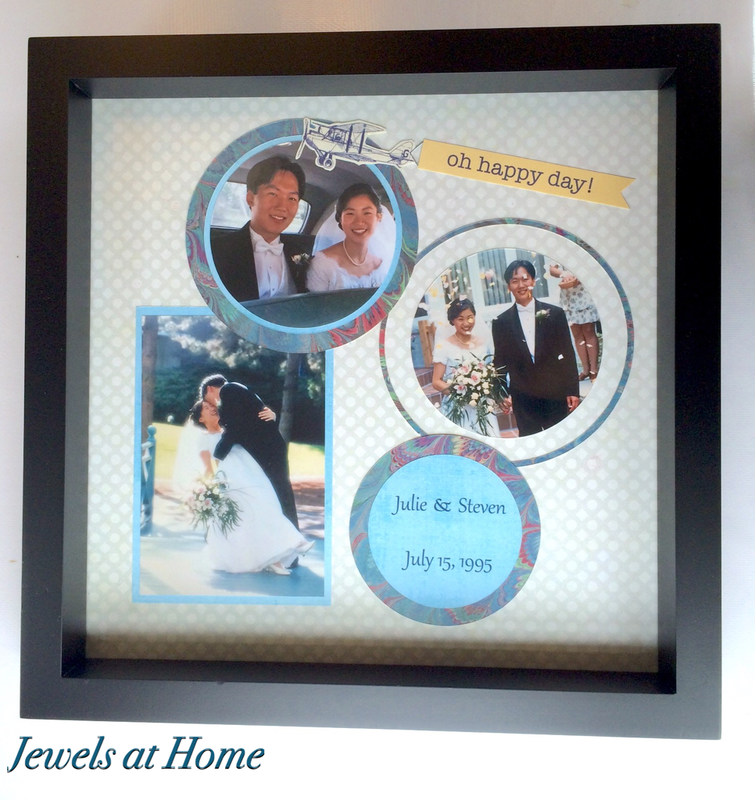 It’s special way to preserve your friends’ favorite images. Hope you’re in the mood to create something special for the ones you love! It’s wedding season, which also means it is anniversary season! A long-time friend of ours just tied the knot, and I wanted to make something special to help preserve the memories for the happy couple. It’s a perfect time to create something to celebrate Steve and my anniversary, too! 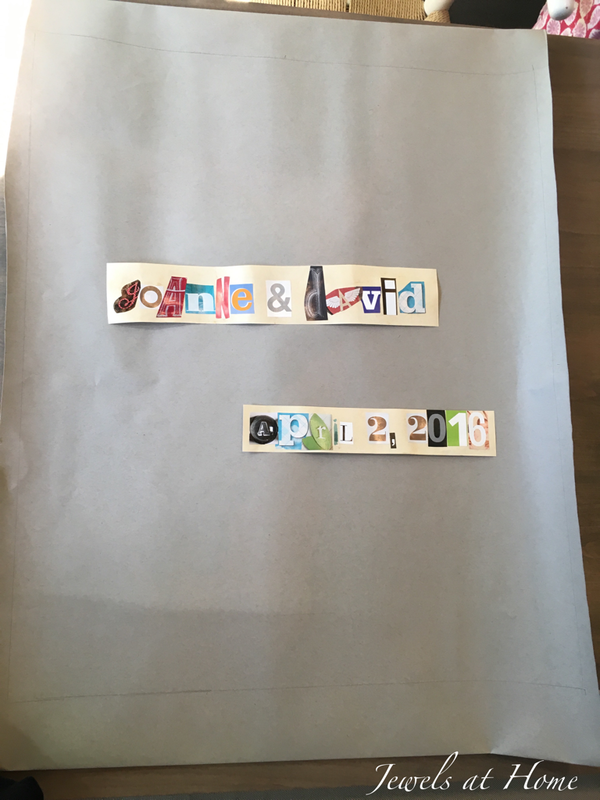 I used pictures from our friends’ wedding announcement to create this simple piece of paper art (I LOVE paper!!). This year is the big 2-0 for me and Steve! 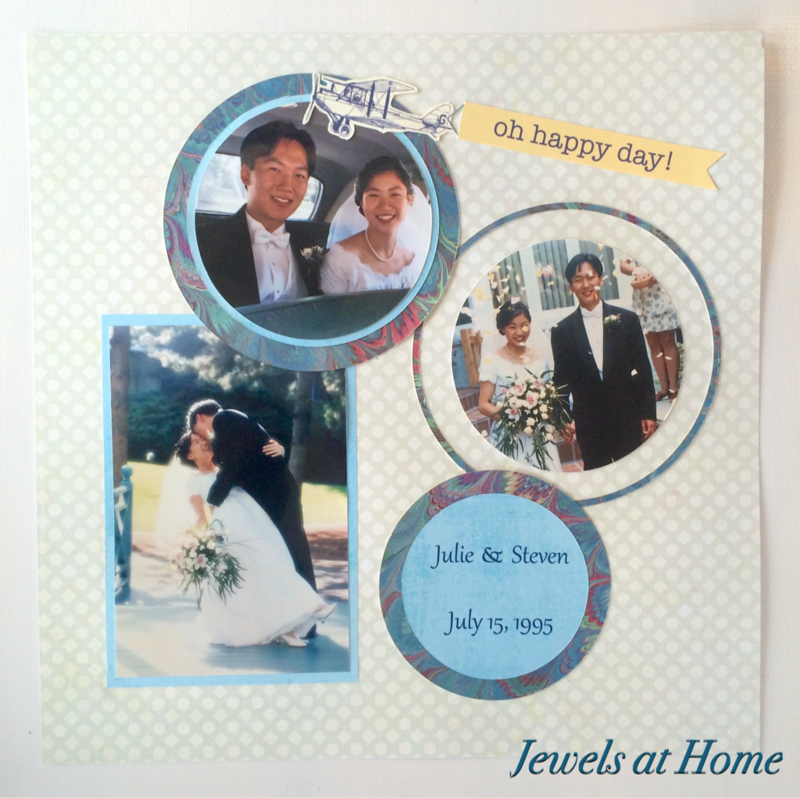 Back in the olden days, when we got married, there were no fancy photo cards, but I combined some of my favorite pictures with more fun scrapbooking paper to create this piece of art for our room. 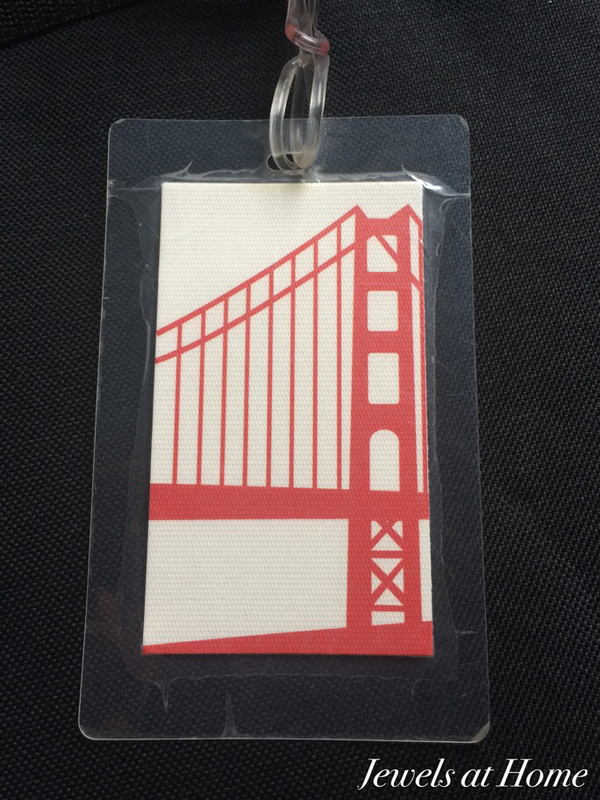 Another fun project I made using wedding invitations were these luggage tags. Nicola and her husband had stunning custom cards incorporating images of the Golden Gate Bridge and a San Francisco cable car. 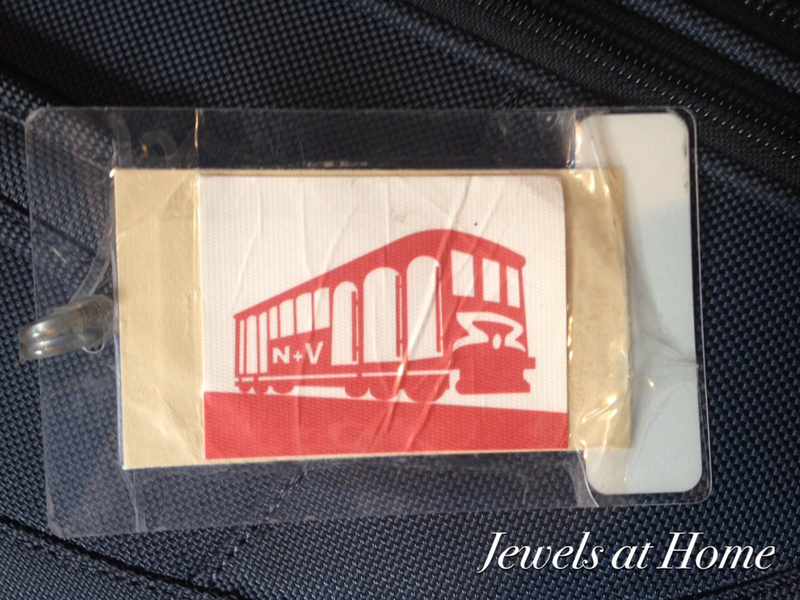 I repurposed some of them into these luggage tags, which are getting a lot of mileage! You could apply this idea to other cards, too. One year, I took all the Christmas cards we received and created paper ornaments using the pictures to send back to our friends. 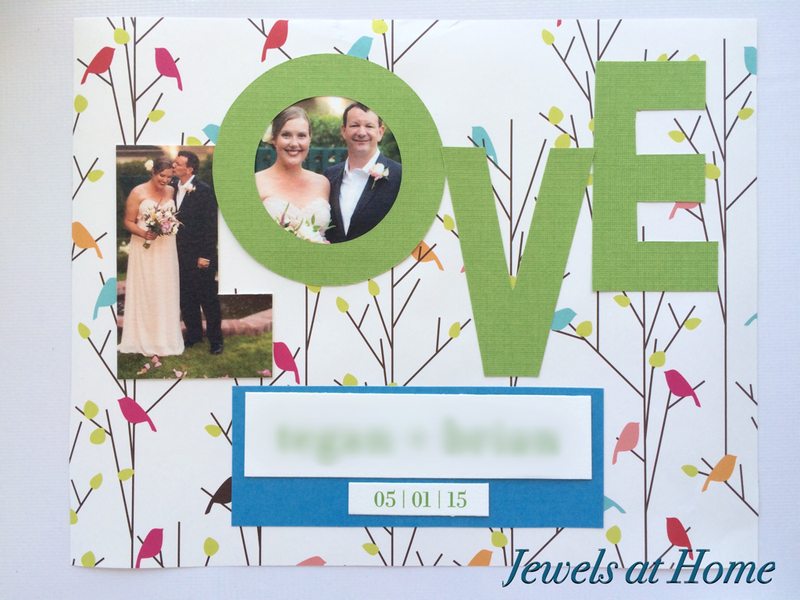 For now, I am looking forward to the next wedding invitation that comes to our mailbox, so I can create a memorable piece of art for someone special! Just every once in a while, I plan a project, and then I actually do it! Yes, really! I recently collected some fun ideas for art projects involving paper, and now I’m excited to unveil my own paper creations. 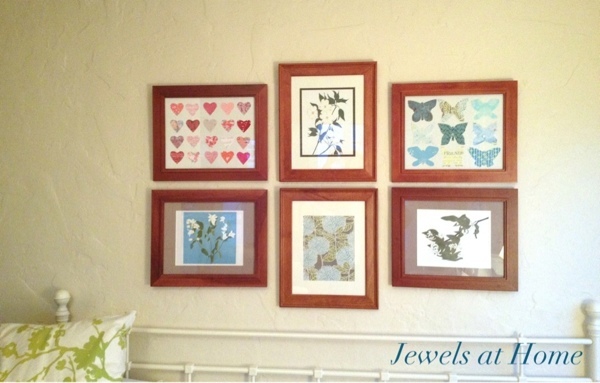 I have a great weakness for pretty prints on paper and fabric, and these easy projects were a great way to display them and create inspiration in my craft studio. I was feeling girly when I collected these pink and red papers – a mix of scrapbook paper, origami paper, scraps from card, and even some paper I made myself! (second row, center) – and cut out rows of matching hearts. 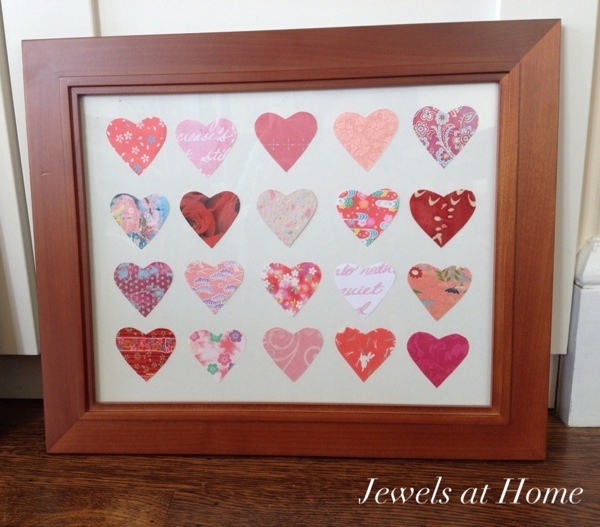 Very easy – I made a heart template out of scrap paper and then traced and cut out this collection. 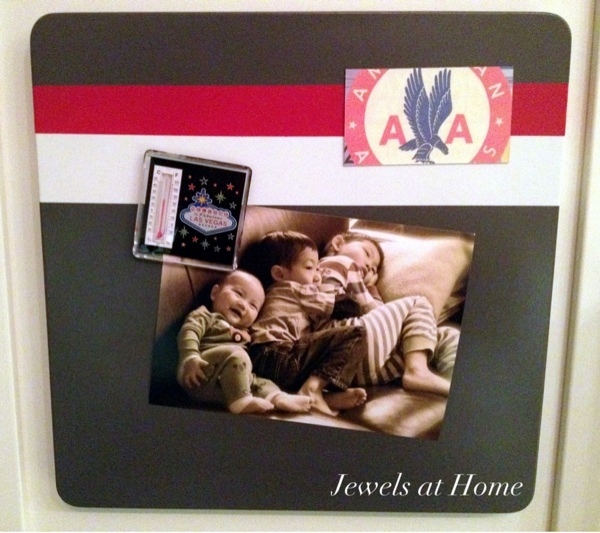 I glued them onto a plain background and popped them into this frame I already had. I had also thought of folding the hearts and making them three dimensional, but I’m happy with how this turned out. No butterflies were harmed in the production of this pretty display piece. While I have fallen in love with pink and red only recently (some kind of reaction to having three boys), I’ve long had a love for the color blue – in fact, my dad still talks about how much I love blue (do your parents also remember you exactly as you were twenty years ago?). Anyway, unlike all the identical hearts, I wanted to make each butterfly unique. Again, I love the mix of papers many of which have stories behind them – an old stationery set, some wrapping paper, and more paper that I hand made (second row, left). These are mixed with some more scrapbook and origami papers for a soothing and pretty work of art. And now, there is finally something to adorn the blank wall in my “studio.” Along with my new paper art, I framed a section of the hydrangea wrapping paper that I used for my desk accessories and added some botanical prints from a calendar. 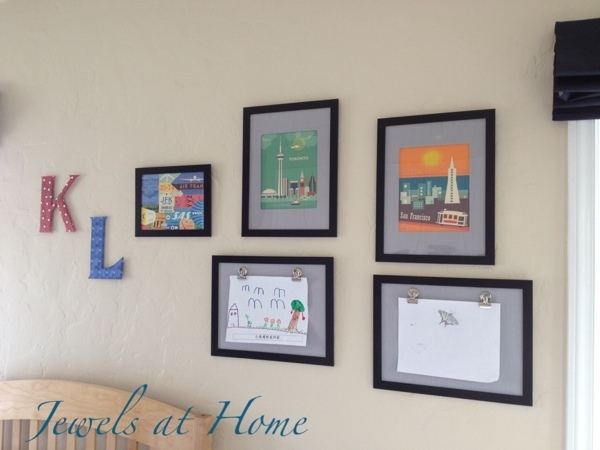 I love how putting something up on the walls makes a space feel like home! My kids’ art projects tend to accumulate in (not so) little plies all over our house. I’m implementing a new system to organize all of it, but more on that later. I would love to have more of their creations up on display, but I get around to it so seldom that the few pieces that are hung are completely outdated. 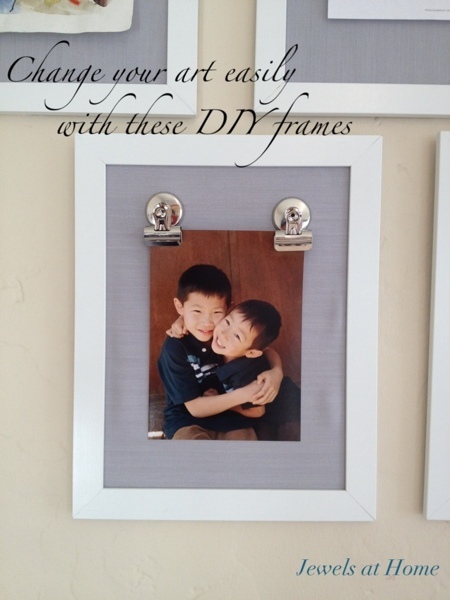 I’ve been looking for a solution that makes it easy to change our our display, and I knew I had found it when I spied these frames with clips from Shanty 2 Chic. I decided to make mine with fabric, rather than paper, backgrounds. 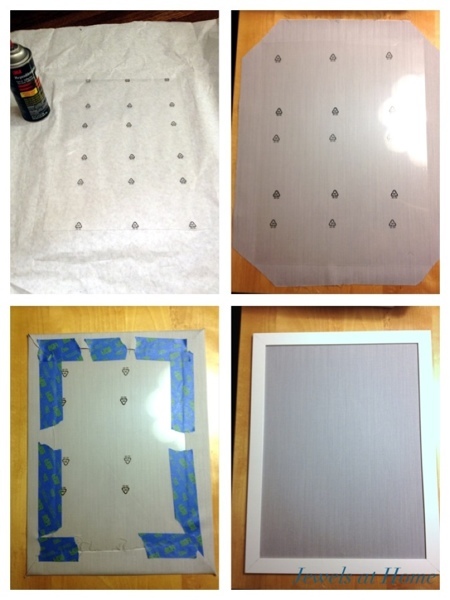 The fabric matches these DIY picture mattes I made. I’ll show you how to make your own! frames – I used NYTTJA frames from Ikea, which are perfect, because the front is plastic that has a protective film on it for packaging. I left the film on, so that if I ever want to use these are regular frames, it will be easy to peel off the fabric. 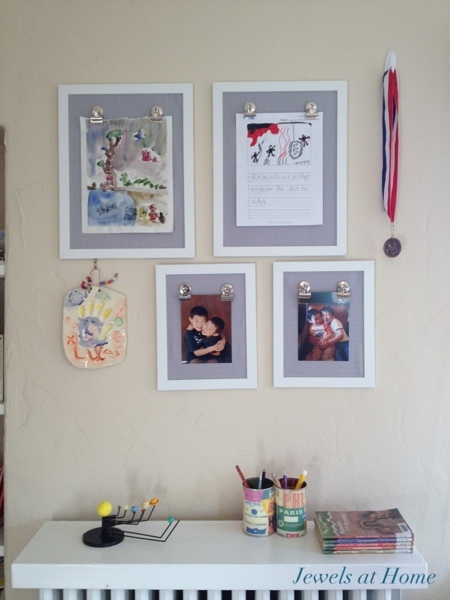 Here is the kids’ new art gallery in their room. I can tell already that I will be using these frames a lot! 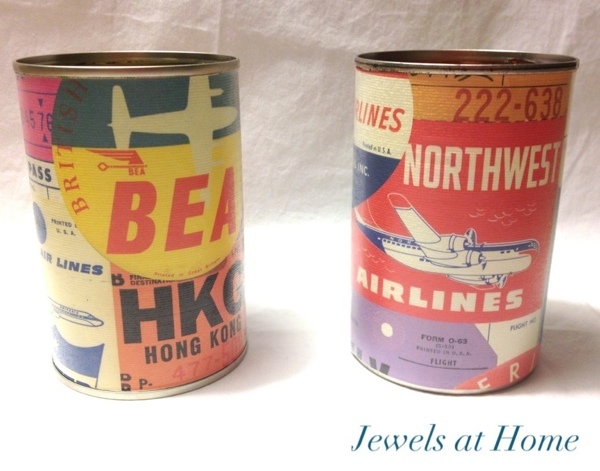 Also pictured are the DIY travel-themed pencil tins I made for them. Next up: I’m getting started on some projects for Christmas! Every time I walk into Lavish in Hayes Valley, I find a great piece of wrapping paper to use for a new project. At just $4 a sheet, these provide a lot of creative bang for the buck. First, there was the graphic red print I used to line J’s nursery bookcase. Next, I found a sweet hydrangea paper for my craft studio. 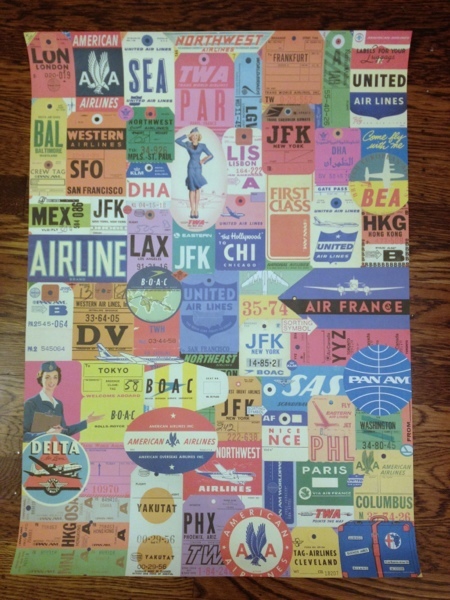 Most recently, I was inspired by this retro air travel print from Cavallini & Co..
Retro air travel paper from Cavallini a& Co. I didn’t originally plan a themed bedroom for our older boys, and I still want to keep it pretty neutral. 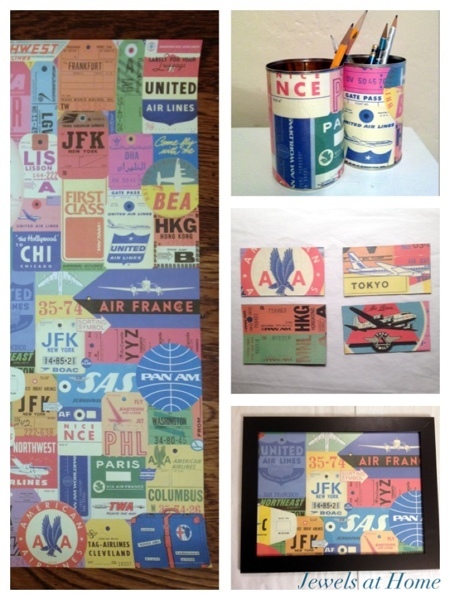 The travel theme evolved first from these beautiful retro-style city posters by Karen Young of Loose Petals. 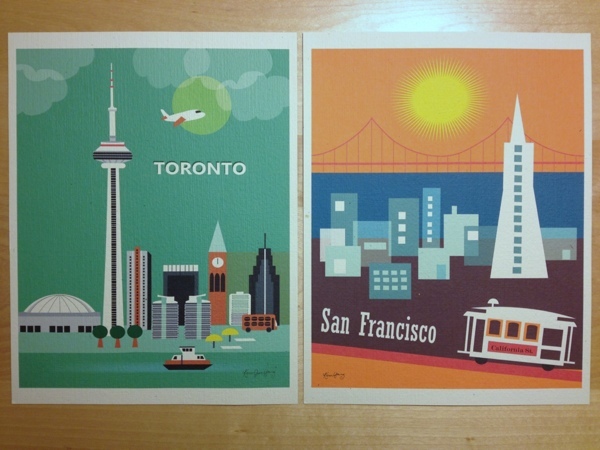 Retro-style city art prints by Karen Young of Loose Petals. When I saw the wrapping paper, I knew it would tie in perfectly. 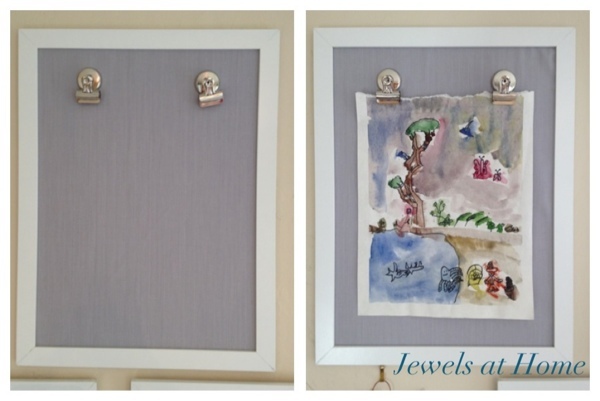 I framed a section of paper as art – easy! 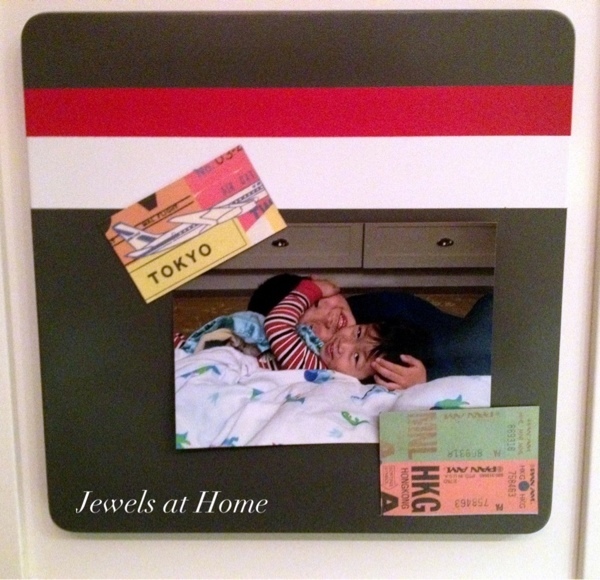 – and then used more for DIY pencil tins and magnets for our DIY racing stripe magnet boards. 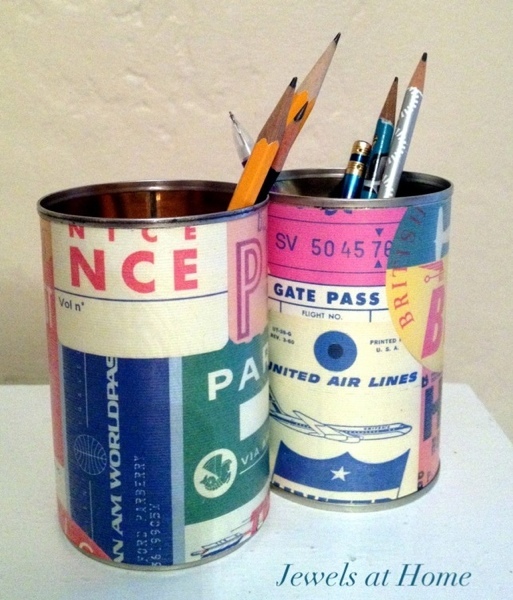 Upcycled DIY pencil tins with cool retro air travel paper. 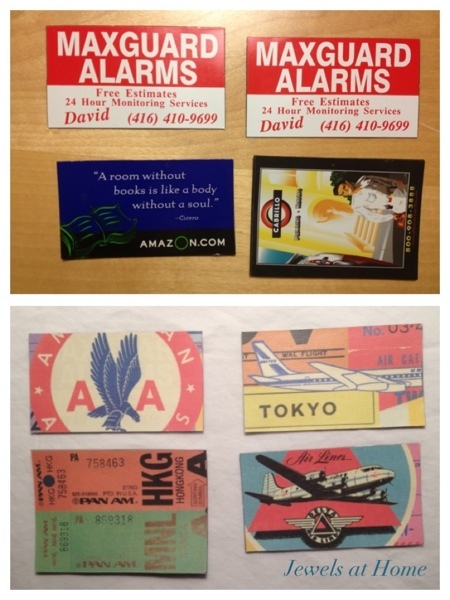 Upcycle advertising magnets with some fun paper. Jewels at Home. Here are those new items pictured in the boys’ room. There’s still plenty of paper leftover. I’m thinking it would be perfect for luggage tags! Yay! I’m excited to see the boys’ room slowly coming together!